We propose a multilayer geometry to characterize thin film samples in reflection terahertz time domain spectroscopy. Theory indicates that this geometry has higher sensitivity compared to ordinary transmission or reflection geometries when characterizing both low and high absorption samples. Pure water and water-ethanol mixtures are measured to verify the characterization accuracy of the proposed geometry and its capability to measure trace liquids. 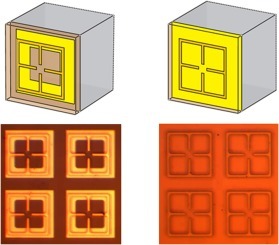 Paraffin-embedded oral cancer tissues are imaged to further show how the proposed geometry enhances the sensitivity for solid low-absorptive films. Balbekin, Nikolay S., Quentin Cassar, Olga A. Smolyanskaya, Maksim S. Kulya, Nikolay V. Petrov, Gaetan MacGrogan, Jean-Paul Guillet, Patrick Mounaix, and Valery V. Tuchin. "Terahertz pulse time-domain holography method for phase imaging of breast tissue." In Quantitative Phase Imaging V, vol. 10887, p. 108870G. International Society for Optics and Photonics, 2019. Pulse holographic imaging along with time-domain spectroscopy scan and tomographic techniques are of great interest. Since the advantages of holography are the lack of focusing optics and high spatial resolution, and, comparing with tomography, less computation cost for numerical reconstruction, this technique is preferable for the analysis of thin histological samples. In this work we have created the experimental scheme that involves measurement of diffraction pattern of the collimated THz pulse field spatial distribution at some distance behind the object in the time-domain mode, thus allowing reconstruction of amplitude and phase distribution at the object plane by numerical backpropagation of the wavefront in the spectral domain. In our experiment, we used a breast biopsy sample containing cancer tissues, we also performed numerical simulations accounting for experimental conditions to confirm the conceptual applicability of the reconstruction method. Hooper, Philippa J., Gabi Kaminski, and J. A. Zeitler. "Terahertz Spectroscopy: An investigation of the Structural Dynamics of Freeze-Dried PLGA Microspheres." (2019). Biodegradable poly lactic-co-glycolic acid (PLGA) microspheres can be used to encapsulate peptide and offer a promising drug delivery vehicle. In this work we investigate the dynamics of PLGA microspheres prepared by freeze-drying and the molecular mobility at lower temperatures leading to the glass transition temperature, using temperature-variable terahertz time-domain spectroscopy (THz-TDS) experiments. The microspheres were prepared using a water-in-oil-in-water (w/o/w) double emulsion technique and subsequent freeze-drying of the samples. Physical characterisation was performed by morphology measurements, scanning electron microscopy (SEM), and helium pycnometry. The THz-TDS data show two distinct transition processes, T<sub>g,β</sub> in the range of 167-219 K, associated with local motions, and T<sub>g,α</sub> in the range of 313-330 K associated with large-scale motions, for the microspheres examined. Using FTIR measurements in the mid-infrared we were able to characterise the interactions between a model polypeptide, exendin-4, and the PLGA copolymer. We observe a relationship between the experimentally determined T<sub>g,β</sub> and T<sub>g,α</sub> and free volume and microsphere dynamics. Shmool, Talia A., and J. Axel Zeitler. "Insights into the structural dynamics of poly lactic-co-glycolic acid at terahertz frequencies." Polymer Chemistry 10, no. 3 (2019): 351-361. The mechanical properties of an amorphous copolymer are directly related to the dynamic processes occurring at the molecular level. Poly lactic-co-glycolic acid (PLGA) is a biodegradable copolymer, and in this work we investigate the dynamics of PLGA and its glass transition behaviour by performing variable temperature terahertz time-domain spectroscopy (THz-TDS) experiments. We correlate PLGA dynamics, as measured at terahertz frequencies, their temperature dependence, molecular weight (MW), lactide toglycolide ratio, and free volume. The THz-TDS data can be used to detect two distinct transition processes, Tβ and Tg,α. To complement our analysis, we use dynamic mechanical analysis (DMA) to probe the β- and α-relaxation processes in PLGA, and compare the results obtained from the DMA experiments with those obtained using THz-TDS. The values of Tg,α, as determined from the THz-TDS experiments, are in good agreement with Tg,DSC, determined by calorimetric measurements, and with Tg,DMA, determined by the DMA measurements. We attribute Tβto the change in dipole moments associated with the β-relaxation process, originating from the local rotation of C–O macromolecular chain segments, and Tg,α to the change in dipole moments due to large segmental motion of the copolymer backbone associated with the α-relaxation process. By showing experimental temperature-dependent results from THz-TDS and DMA for PLGA, we demonstrate that the behaviour of PLGA is in line with the potential energy surface interpretation by Goldstein as well as the free volume theory of Fox and Flory, and that both concepts together can be used to understand amorphous polymers. Kleist, Elyse M., Corinna L. Koch Dandolo, Jean-Paul Guillet, Patrick Mounaix, and Timothy M. Korter. "Terahertz Spectroscopy and Quantum Mechanical Simulations of Crystalline Copper-Containing Historical Pigments." The Journal of Physical Chemistry A (2019). Terahertz spectroscopy, a noninvasive and nondestructive analytical technique used in art conservation and restoration, can provide compelling data concerning the composition and condition of culturally valuable and historical objects. Terahertz spectral databases of modern and ancient artists’ pigments exist but lack explanations for the origins of the unique spectral features. Solid-state density functional theory simulations can provide insight into the molecular and intermolecular forces that dominate the observed absorption features as well as reveal deviations from simple harmonic vibrational behaviour that can complicate these spectra. The characteristic terahertz spectra of solid azurite, malachite, and verdigris are presented here, along with simulations of their crystalline structures and sub-3.0 THz lattice vibrations. The powerful combination of theory and experiment enables unambiguous spectral assignment of these complex materials and highlights the challenges that anharmonic peak broadening in organic-containing materials may present in the construction of reference pigment databases.